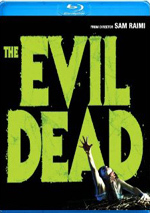 Ash (Bruce Campbell), the sole survivor of The Evil Dead, continues his struggle with the forces of the dead. With his girlfriend possessed by demons and his body parts runnning amok, Ash is forced to single-handedly battle the legions of the damned as the most lethal - and groovy - hero in horror movie history! Welcome to Evil Dead II: Dead by Dawn, director Sam Raimi's infamous sequel to The Evil Dead and outrageous prequel to Army of Darkness! $807.260 thousand on 310 screens. Expectations can be a bear. 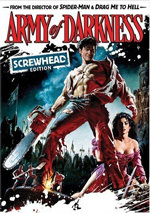 When I got a copy of 1993's Army Of Darkness, I had some idea what kind of film it would be but I wasn't prepared for how much I'd enjoy it. The movie offered a wild and witty romp that entertained me thoroughly at all times. As such, I greatly looked forward to getting Army's predecessor, 1987's Evil Dead II. Although I knew it had a different setting, I figured this movie would follow along similar lines and would provide more insane thrills with reluctant and cowardly hero Ash (Bruce Campbell) as he fought mysterious undead forces. Dead II couldn't live up to my expectations, but it worked pretty well on its own. Fans have consistently argued whether or not Dead II provided a sequel to Evil Dead or a remake. I don’t understand the confusion, as Dead II clearly provides an extension of the original’s tale. It opens with a very quick recap of the first flick and then keeps on keeping on. Granted, it does take some liberties. Oddly, it eliminates three of the original’s five characters and alters a few other things in its brief flashback. Nonetheless, nothing else about the movie redoes aspects of its predecessor. It offers totally new characters and situations; they just happen to occur in the same setting. Whereas Army was largely an outrageous comic book, Dead II functions more as an over-the-top horror film. Don’t expect a great story here. Most of the time Dead II just feels like various acts of monster violence with little purpose. Granted, life works that way sometime; if you're being attacked by undead forces, you may not actually have any kind of general theme to surround those events. Nonetheless, it made the results a little less stimulating to me, as the movie seemed to go nowhere at times; it's just a lot of running around and killing without much purpose or direction. Though it doesn’t approach the greatness of Army, Dead II has some solid moments of wackiness and silliness. Director Sam Raimi creates an entertaining and wild atmosphere which stretches the boundaries of horror movies. I definitely think Dead II improves upon the model launched with the original flick; it’s even cartoonier and wilder, and it benefits from superior production values. Dead II features some genuinely inspired sequences. The segment in which Ash battles his possessed hand is one for the ages, bolstered by a truly remarkable performance from Campbell. He acts as though he really can’t control his hand, and this makes the scene all the more convincing – and delightful. When I first saw Dead II, I’d just watched Army of Darkness weeks earlier, and the earlier film didn’t compare well in my opinion. That was a decade ago, however, and I’m now in the midst of a rapid revisit of the three movies. This time I viewed Evil Dead before I took in Dead II, and that made a huge difference in terms of my enjoyment. On the heels of Army, Dead II disappointed me, but right after Evil Dead, the first sequel looked pretty good. I’ve not yet re-examined Army, so I don’t know where this trip will take me. I do know that Dead II now looks better to me than it did 10 years ago. I’m not sure if I’ll still think it’s substantially inferior to Army, but at least I can better appreciate its definite charms. 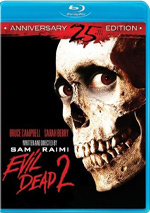 Evil Dead II appears in an aspect ratio of approximately 1.85:1 on this Blu-ray Risc. The limitations of the source material mean the flick will never look great, but the Blu-ray offered reasonably strong visuals. Sharpness usually looked fairly crisp and accurate, though some light softness occurred at times. For the most part, I thought the movie was adequately focused and detailed. Moiré effects and jagged edges posed no concerns, and edge enhancement appeared absent. I suspect some digital noise reduction was used here, as some shots came across as a little too “smoothed out” and artificial, but if so, the technique wasn’t utilized to an excessive degree; the movie still featured decent grain and an acceptably natural look. Print flaws were a non-factor, as the image suffered from no specks or marks. Colors were decent. The movie didn’t go with a broad palette, but its bloody reds and pukey greens delivered acceptable clarity. Black levels looked a bit mushy to me and they lacked boldness or depth; there's a mildly tentative quality to the dark scenes. Shadows were a little too dark but not terribly so. This ended up as a pretty good representation of the source. More substantial problems came with the DTS-HD MA 5.1 soundtrack of Evil Dead II. Actually, some parts of it seemed positive, such as the breadth of the soundfield. The action spread nicely to the side channels, with a great deal of effects and music emanating from the front right and left speakers. This usage added a nice component of involvement to the mix, especially when we consider the extra kick boasted by the rears; the surround speakers presented solid ambiance and occasionally tossed out some good split-surround effects as well. The track lacked the smooth integration of true 5.1 mixes, but it worked nicely from a soundfield point of view. Unfortunately, the quality of the audio was less than positive. Dialogue came across as thin and lifeless at best, and it became harsh and edgy at times. I understood most of the speech, but some lines were tough to comprehend due to the shrill and sibilant nature of the audio. Effects displayed some distortion as well, and they lacked much clarity. The music appeared thin but was largely free of the harshness that harmed the other aspects of the mix. Despite the fairly ambitious soundfield, I simply couldn't give this mix a higher rating than a "C+" due to the weak quality of the audio. How did the picture and sound of this Blu-Ray compare with those of the original 2007 Blu-ray? Both showed improvements. The audio was peppier and smoother, while the visuals were tighter and cleaner. The new Blu-ray didn’t blow away its 2007 predecessor, but it created a definite step up in quality. This 25th anniversary Blu-ray mixes old and new components. I’ll mark fresh materials with special blue print. First up we get an audio commentary that comes from a 1998 laserdisc release of Dead II. It features actor Bruce Campbell, director Sam Raimi, co-writer Scott Spiegel, and special make-up effects artist Greg Nicotero, all of whom were recorded together for a running, screen-specific chat. All four men provide roughly equal amounts of information. The commentary covers a mix of production issues. We hear a lot about low-budget filmmaking. The guys provide notes about makeup and effects, continuity problems, locations and sets, characters and the actors, and many bits of trivia. Although the Dead II commentary is more fun than the one for Army of Darkness, it's probably less informative, which is often the case with multiple-participant tracks. Frequently these become loose and disorganized as the parties involved become more interested in laughing with each other than in providing compelling information about the movie. The Dead II commentary straddles those lines, and it generally seems amusing and useful, although at times it goes a little astray. Still, I enjoyed the commentary as a whole and found it pretty entertaining. With Swallowed Souls: The Making of Evil Dead II, we get a one-hour, 38-minute and 13-second documentary. It features Campbell, Spiegel, Nicotero, crew member Josh Becker, studio manager David Goodman, special makeup effects artists Robert Kurtzman, Shannon Shea, Aaron Sims and Howard Berger, special makeup effects supervisor Mark Shostrom, stop-motion animators Doug Beswick, Rick Catizone and Tom Sullivan, assistant animator Brian Rae, miniature supervisor Jim Belohovek, art director Philip Duffin, director of photography Peter Deming, editor Kaye Davis, and actors Ted Raimi, Sarah Berry, Robert Domeier, Danny Hicks, and Kassie Wesley. “Souls” looks at the delayed release of the first Evil Dead movie and the eventual path to Dead II and its development. From there we look at story/characters, cast and performances, various effects, thoughts about Sam Raimi, animation, storyboards and photography, editing, ratings and release. The only disappointment here stems from the absence of Sam Raimi; for reasons unknown, the director skips the program. Even without him, though, “Souls” delivers a strong look at the flick. It covers a wide array of subjects and does so with honesty and pizzazz. “Souls” brings us a lively and enjoyable documentary. Footage from the set arrives via the 30-minute, 22-second Cabin Fever – A Fly on the Wall Look Behind the Scenes. It offers what the title describes: footage from various aspects of the production. We see the effects folks do their work and also watch the action on the set. Some of this appears during “Souls”, but much of it remains exclusive to “Fever”, so we get a lot of valuable shots. Road to Wadesboro: Revisiting the Shooting Location with Filmmaker Tony Elwood runs eight minutes, nine seconds. Elwood worked on special effects props during Dead II, and here he leads us around the film’s North Carolina locations. It’s not fascinating, but it gives us some decent observations. Next up is The Gore the Merrier, a 31-minute and 51-second featurette about Dead II. It mainly discusses the technical details, and it does so in a terrifically compelling manner. The program features contemporary interviews with make-up effects artists Robert Kurtzman, Howard Berger, and Greg Nicotero; they essentially act as the piece's narrators. While we find some "talking head" shots of those gentlemen, the vast majority of the visual action comes from a slew of wonderful video footage taken from the set. We get a lot of great information from these images, and they single-handedly make this a fantastic documentary. Another featurette called Evil Dead II: Behind-the-Screams goes for 17 minutes, seven seconds. Narrated by animator Tom Sullivan, it shows a variety of production photos. We get a nice array of images, and Sullivan throws in a lot of good details. Four Still Galleries show up next. These cover “Advertising and Memorabilia” (26), “Behind the Scenes” (26), “Special Make-Up Effects” (32) and “Stop Motion Animation” (17). These add up to a nice collection of images. The disc opens with ads for Scary Movie, Dead Alive, ‘Fear.net Originals” and The Last Exorcism. These appear under Also from Lionsgate too, and we get the trailer for Dead II as well. Although not my favorite of the three Evil Dead movies, Evil Dead II provides a fun romp. It mixes horror with campy silliness in a satisfying manner. The Blu-ray offers relatively positive visuals, acceptable audio and a nice array of good supplements. This turns into a nice release for an entertaining flick.